April 1, 2019 | 1:30 p.m. Using dogs to chase gulls from Great Lakes beaches can improve water quality, according to a February 2019 study. Researchers at Central Michigan University used dogs to reduce bird feces on beaches. The waste of gulls introduces high levels of Escherichia coli bacteria into sand and beach water, according to an article in the Oxford University Press. E. coli can contain pathogens such as avian influenza and salmonella, microbiologist Elizabeth Alm and mammologist Thomas Gehring reported in the study. The dogs' harassment reduced the number of gulls by 56 percent to 76 percent. "I was pleasantly surprised that we actually saw a [strong reduction of] gulls and [improved] water quality," said Gehring, a wildlife ecology professor at Central Michigan University. Gehring's previous work using dogs to reduce conflicts between wild animals and people gave him the idea of using border collies to chase the birds, said Alm, a biologist at the same university. "Border collies are super smart," Alm said. "They'e very intelligent dogs. They train well because of their natural herding instincts. They chase the gulls but they have no interest in capturing them or hurting them." During the summers of 2012 and 2013, Alm and Gehring studied two collies at beaches in Michigan cities on Lake Michigan. They included North Beach Park in Ferrysburg, Kirk Park in West Olive and the Grand Haven Beach Association and Rosy Mound Park in Grand Haven. For 38 days, they conducted two trials where collies controlled gulls on two beaches while the other two were uncontrolled, Alm said. They counted how many gulls were on beaches every 15 minutes. After the 38 days, they removed the dogs for 10 days. Then they alternated this process for the second trial. The previously uncontrolled beaches were now controlled by dogs. After noticing a pattern of when gulls arrived on beaches, Alm and Gehring changed their method in the second summer. In 2012, dogs controlled beaches seven days a week from dusk until dawn, Alm said. She and Gehring noticed birds arriving after sunrise and returning before sunset. The next year, they had dogs control beaches only at peak arrival times to harass them in larger abundance, Alm said. The researchers positioned themselves in the central section of beaches while keeping the dogs under voice and whistle command, Gehring said. 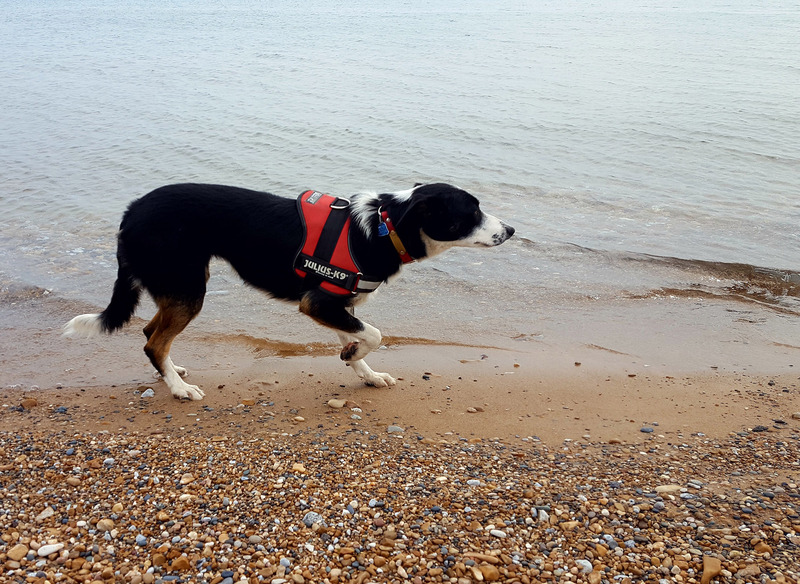 Because of their natural instinct to prey on gulls, minimal training is needed for collies, said Shayna Taylor, kennel manager and staff biologist at Wild Goose Chase, a goose and pest control business. "[Collies] start to stalk a gull, get really low and stare it down," Taylor said. "They kind of mimic the posture of what a natural predator would be for the gulls." A border collie, owned by Susan Hagberg of Wild Goose Chase, pursues helps manage gulls at Jeorse Park Beach in East Chicago, Indiana. Dogs making eye contact with gulls scares them away, Taylor said. The act of staring down gulls and slowly creeping toward them will make them feel like they're about to be hunted. In the beginning of training, collies are on a 20-foot leash, Taylor said. Once a dog has been fully trained and trusted to come back, they roam free. "Over time, if [dogs] are there every single day chasing them, [gulls will] think, 'obviously there's a predator here every single day, maybe we should go find somewhere else to be,'" Taylor said. In Wisconsin, the Milwaukee County Parks Department has experienced better water quality due to collies controlling gulls for 30 hours each week, according to TMJ4 Milwaukee. Collies are a good management option because of their effectiveness at keeping gulls off beaches, Alm said. They are a non-lethal way to reduce gull waste. The birds don't get used to them or ignore them like they do to other deterrents. "Border collies are arguably more attractive than, for example, wires." Alm said. Editor's note: This article was originally published on March 27, 2019 by Great Lakes Echo, which covers issues related to the environment of the Great Lakes watershed and is produced by the Knight Center for Environmental Journalism at Michigan State University.